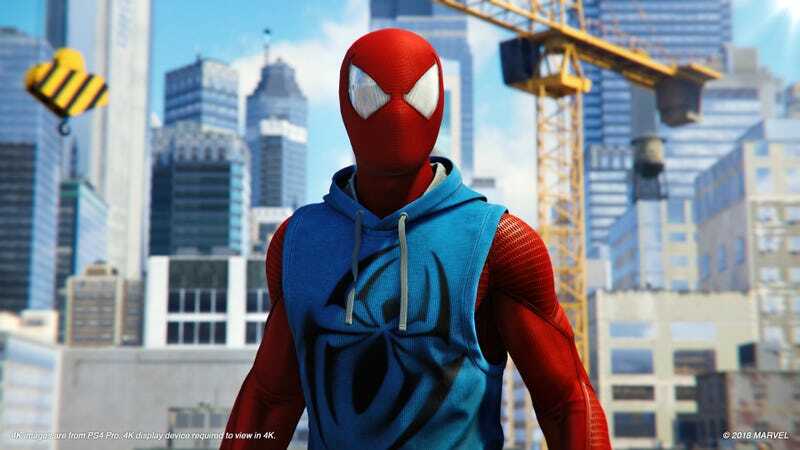 Look, I’m sorry, but the Scarlet Spider costume is incredible. Insomniac, if you need ideas for the sequel, I’ve got a few. The recent Spider-Man game had a lot of things going for it, but one of the best was its alternate costumes. Commemorating Spidey’s penchant for inventing new costumes, and/or just finding them lying around on alien planets, the unlockable Spidey wear was a really welcome and well-executed bit of fan service. Unfortunately, a few costumes were missing. Here are the best Spider-Man costumes that didn’t make the cut, according to me, a Spider-Man fan with questionable taste. Note that I didn’t include the costumes of some other prominent Spider-people, even though we all know Miles Morales’s Spider-Man costume is incredible and I need a Spider-Gwen spinoff, like, yesterday. I get why those aren’t in the game, and here’s hoping Miles suits up in the sequel. Cool? Cool. Let’s get to it. Definitely not an alien menace or anything. Illustration: Secret Wars, art by Mike Zeck and John Beatty. Yeah, sure, this will probably show up in DLC or a sequel, but its absence was still jarring. Artisanally sourced on an alien planet during the Secret Wars crossover, it’s the quintessential alternate Spider-Man suit, the standard against which all others are judged. And it’s sleek. Specifically, about how I’m Doctor Octopus. Doctor Octopus! Spider-Man! Two great tastes that taste great together. This costume bears a resemblance to some other major Spidey costumes, one from lower on our list in particular, but it has verve. And those arms are so functional! AKA “Captain Universe” Spider-Man. Once upon a time, Spider-Man temporarily merged with the cosmic power and persona of Captain Universe, getting a new look in the process. Now, this is a very silly costume. That’s why it’s great. It’s super ridiculous. I want it in 4K. Unironically, this costume is amazing. When Peter temporarily joined the Fantastic Four’s superhero organization, he got this elegant white-and-black number. This look is just distinct enough from his regular costumes to stand out, while still being recognizably Spider-Man. A class act, all around. A nice guy, I swear. An obscure pick, but I love it; in the old Exiles books, we meet an alternate Peter Parker who merged with the Carnage symbiote, becoming “The Spider”, a ‘90s-edgy version of Spider-Man with just as much wrath as snark. Not a great character, admittedly, but the mixture of the Carnage-red styling with minimal Spidey details? 10/10, honey, you’re owning it. He has them ‘90s super-thighs. Say what you want about the Clone Saga, but Ben had some great fashion sense. (His current iteration, not so much.) This suit rejiggers the classic Spider-Man costume elements in a way that just totally works for me. And I’ll honestly never get tired of the outside-the-costume web shooters. They add character. Least you could’ve done is drop him off at his apartment. Once upon a time, poor ol’ Peter Parker was naked. After ditching the symbiote with the help of Reed Richards, he needed a way to get home without his secret identity being discovered. And so is born the Bombastic Bag-Man, the great Spider-Man offshoot hero of them all. See how his bag flaps majestically in the wind! The fact that this wasn’t included is criminal. Sometimes, you have to improvise. And sometimes, you improvise badly. During a minor arc in Ultimate Spider-Man, Peter had to journey out with a half-finished costume, and spent multiple issues wearing this. Look at his li’l socks! Put this in your game, Insomniac, and I’ll never wear anything else. io9 Weekend Editor. Videogame writer at other places. Queer nerd girl.